Special events have the ability to set a Miracle Network Dance Marathon program apart from other campus organizations. Many Dance Marathon programs host signature events that go above and beyond a typical 5K and take place outside of their main Dance Marathon event. These events incorporate innovation, tradition and demonstrate impact through the funds and awareness raised and the participants they engaged. Below are some examples of special events that Miracle Network Dance Marathon programs hosted during the 2016-2017 academic year that were submitted for the Best Special Event award, which will be presented at the 2017 Dance Marathon Leadership Conference in July. 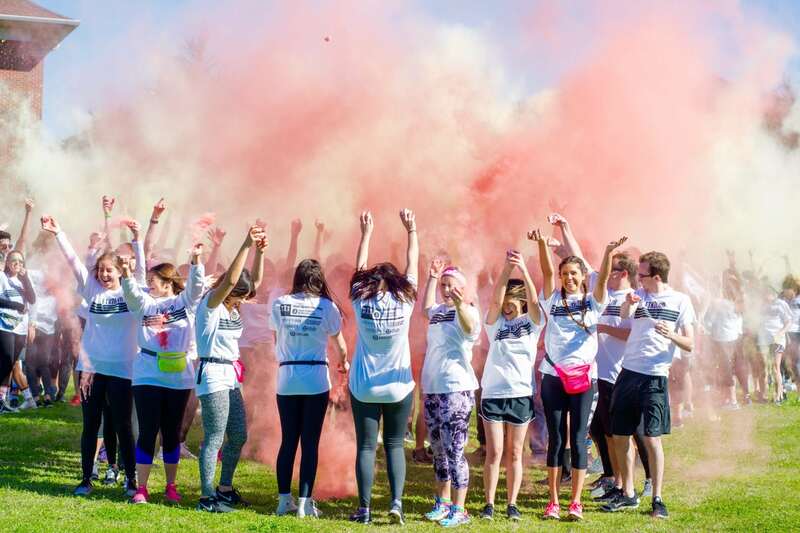 Dance Marathon at Florida State University held their 2nd annual powder paint festival called FTKolor, which included delicious food donated by various sponsors, a DJ, games and 1,000 pounds of powder paint. Each FTKolor ticket purchase included entry into the event and a FTKolor shirt. This special event provides the unique opportunity to unite both our students and the surrounding Tallahassee community in a fun and engaging event. Additionally, FTKolor serves to raise funds, awareness, and excitement for DM at FSU’s 2017 marathon weekend, which was scheduled a few weeks out. In 2017, DM at FSU exceeded both of its goals, and sold an upwards of 1,000 tickets and made a profit of more than $8,000, a significant improvement over their 2016 FTKolor fundraising total of $1,780. This increase in ticket sales and profit was a result of strategic online marketing, combined with increased local partnerships. See this article from The Odyssey that helped promote the event. We had so much fun at our second annual FTKolor! We want to give a huge thank you to American Campus Communities for sponsoring this event, and to everyone who came out and participated! 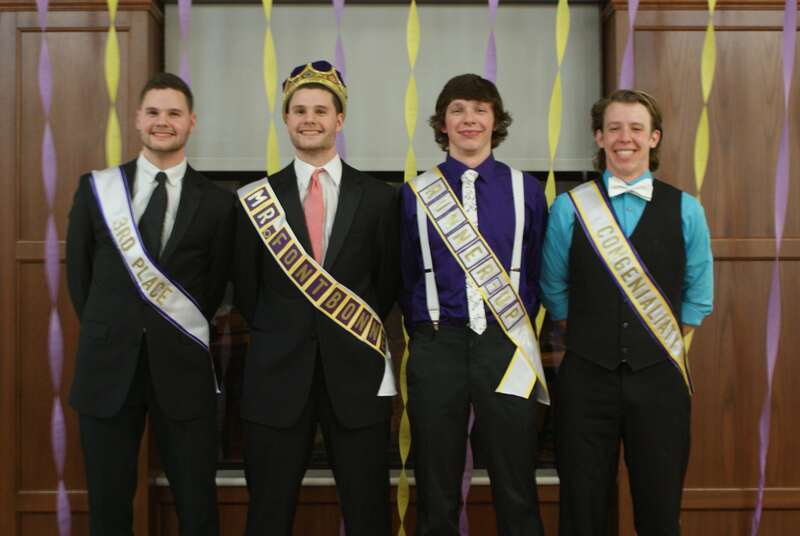 In their first year on campus, Fontbonne University Miracle Network Dance Marathon hosted a “Mr. Fontbonne Competition” during their Ignition Week the week before their inaugural Dance Marathon event. “Mr. Fontbonne” was a collaborative event hosted by FBUDM and the Fontbonne Activities Board. The event called for male contestants to submit applications and perform basic talents in an effort to receive scores from judges and monetary votes from the audience. Contestants were taught an opening dance sequence, were asked to prep “Spirit Wear” that educated the audience on the various theme hours that would take place during the main event, perform a talent, and answer a question in formal wear that highlight the “For The Kids” spirit and Dance Marathon movement. In an effort to connect the audience to the cause, Miracle Kid Peyton served as a judge and her mother told her amazing story while scores were counted. After the story, the contestants went into the audience with donation jars and the contestant that collected the most donations would be granted an additional prize.With 12 contestants and over 150 event attendees, the event raised over $350.00, averaging more than $50.00 per contestant. Mr. Fontbonne contestants with Miracle Kid Riley. Georgia College Miracle hosted a special event called Miracle’s Got Talent, which a talent show that showcased their Miracle Kids and students from across their campus. 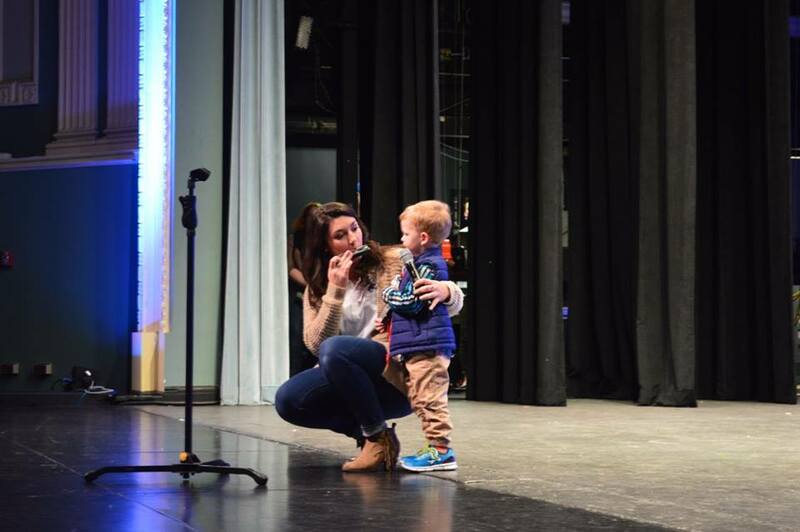 Not only did Miracle Kids perform in the talent show, they also filled other roles such as helping back stage, hosting the event, and serving as judges. The event started off with all of their Miracle Kids and their families arriving early and giving them the celebrity treatment. Each child got their hair and make up done by their very own “glam squad,” while also getting food, drinks, and their own gift bag. The night was followed with wonderful talents that ranged from playing musical instruments to lassoing members of the audience. The night ended with an awards ceremony that honored all of our Miracle Kids as winners followed by an autograph session with the kids. 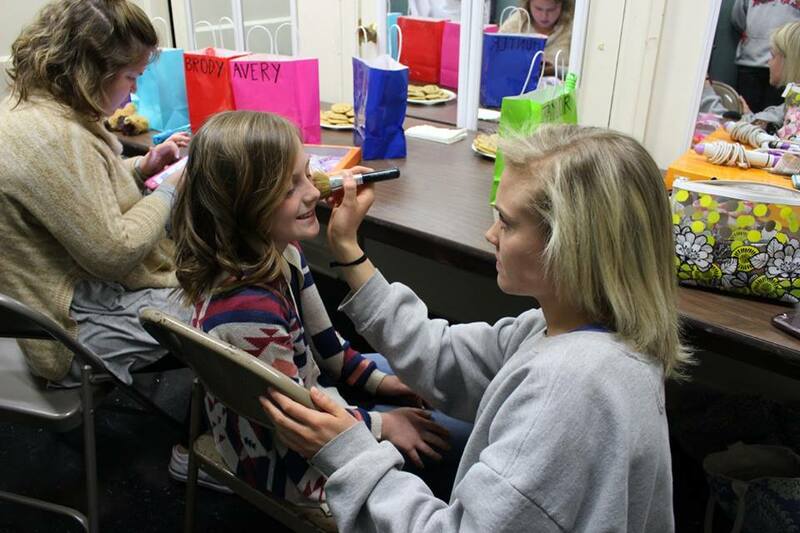 GC Miracle students serving as a “glam squad” for the Miracle Kids participating in Miracle’s Got Talent. GC Miracle students and Miracle Kids performed talents on stage during Miracle’s Got Talent. Aztec Dance Marathon at San Diego State University hosted its inaugural Miracle Week from November 14th-November 18th in 2016. They wanted each day of Miracle Week to hold a different purpose with a different goal, including Inspiration Day to connect students to the cause, Recruitment Day to register students for their Dance Marathon, Education Day to share facts and stories from Rady Children’s Hospital all over campus, Fundraising Day to unite the campus toward a common fundraising goal, and Appreciation Day to celebrate each person involved in the movement with free food, giveaways and activities in their student union. The overall goal of Miracle Week was to dedicate an entire week to strengthening the relationship they had with students who had already attended ADM in the past and to recruit more Miracle Makers on their campus by sharing why dance marathon is so important to the kids in our community. Their specific goals to recruit 250 new registered dancers and to raise $5,000 were completely blown out of the water as they recruited 1,239 new dancers on Recruitment Day and fundraised a total of $13,000 on Fundraising Day. Throughout the entire week, they brought in $25,000 toward their overall fundraising total. 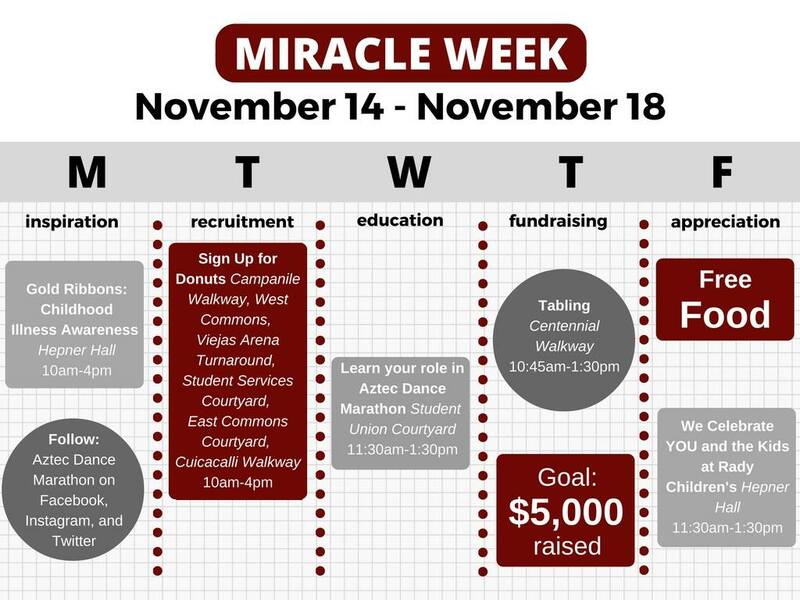 Aztec Dance Marathon’s Miracle Week Schedule of Events. This year, Seattle University Dance Marathon hosted their second annual Miracle Day. This year, the theme of the event was One Day $25K, celebrating their overall fundraising goal to raise $125,000 for Seattle Children’s Hospital. They set out to raise at least $25,000 on January 25th (1/25) as part of Seattle University’s 125th Anniversary campaign. 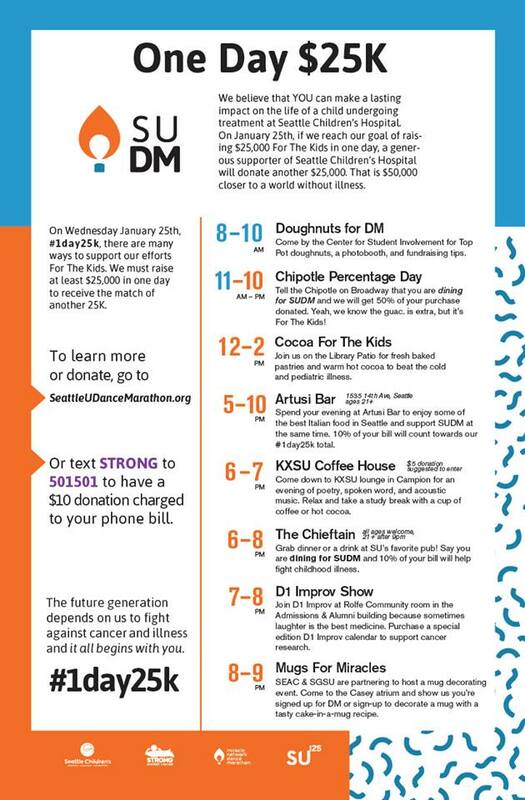 Miracle Day included a full day of events, percentage nights, and news appearances to increase awareness about SUDM both on campus and around Seattle. Seattle University Dance Marathon painted their entire campus blue and orange, their SUDM colors, and dressed classrooms, bathrooms, and hallways with streamers and balloons to highlight their birthday party theme for the year. Morale Captains and Steering members walked around campus all day wearing purple super hero capes in conjunction with Seattle Children’s Strong Against Cancer Initiative, carried around mason jars collecting donations, and participated in flash mobs around campus throughout the day. Leading up to the event, their university chapel donated two of the collections from their services to SUDM’s One Day $25K efforts. They also hosted a dime wars competition in all of their residence halls, an SUDM themed Seattle University Basketball game on January 26th where they preformed their Morale Dance at half time and revealed their fundraising total, and fundraising incentives throughout the day such as t-shirt and gift card giveaways. They also got permission from the president of their university to send out a letter to all students, staff, faculty, and alumni about One Day $25K. Finally, they ended the night with a phone-a-thon where they called all of their registered dancers congratulating them on their donations collected and encouraging them to continue fundraising. In order to keep their campus updated on their fundraising progress throughout the day, they provided live Facebook updates of a giant thermometer that remained in our student center all day tracking our progress. For the first time in SUDM history, they were featured in The Seattle Times and other news sources such as King 5 News and 106.1 KISS FM. SUDM’s Miracle Day surpassed their goals, raising a total of $61,251.25 in less than 24 hours, bringing in 41% of our overall fundraising for the year. On January 25th alone, they had over 1250 views on their website and 22,000 views on Snapchat–incredible numbers for their campus that has an undergraduate population of 4,500. 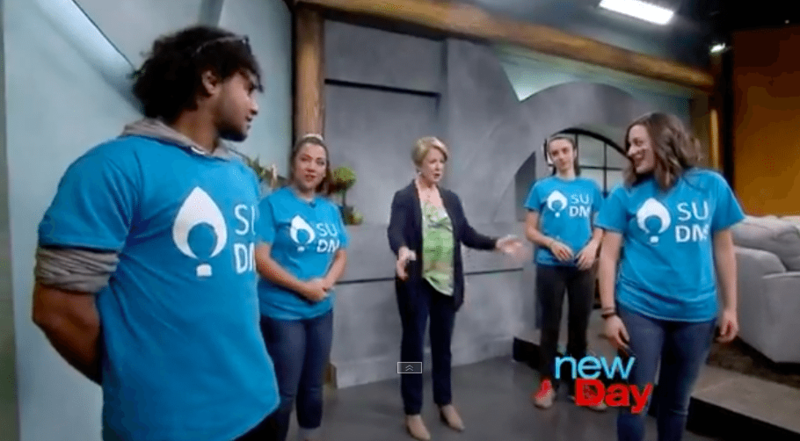 Seattle University Dance Marathon students appearing on Seattle’s King 5 morning news program. 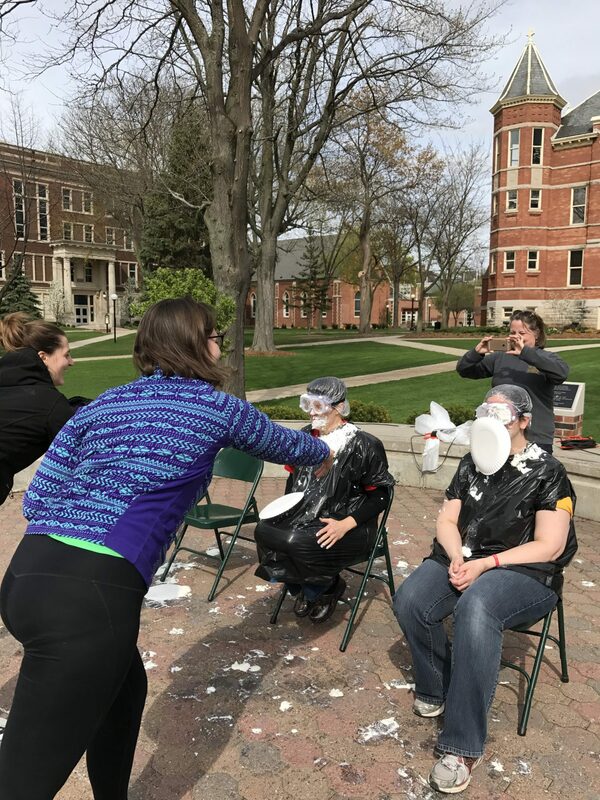 Before finals week every year, St. Norbert College Dance Marathon hosts “Pie A Professor” to bring the entire campus community together to both celebrate the academic school year and raise funds for Children’s Hospital of Wisconsin. The afternoon of the event, faculty, staff, the Dance Marathon co-presidents, and even the president of the college took their turn getting pied in the face for donations of $2, $5, or $10 depending on the distance the donor wishes to pie from. This year the event raised $1,320 and engaged a large percentage of the 2,200 students on campus. St. Norbert College Dance Marathon also used the event to spread awareness about their cause and to generate excitement about Miracle Day, their annual Dance Marathon event, happening during the fall 2017 semester where they hope to raise $70,000 for their local hospital. 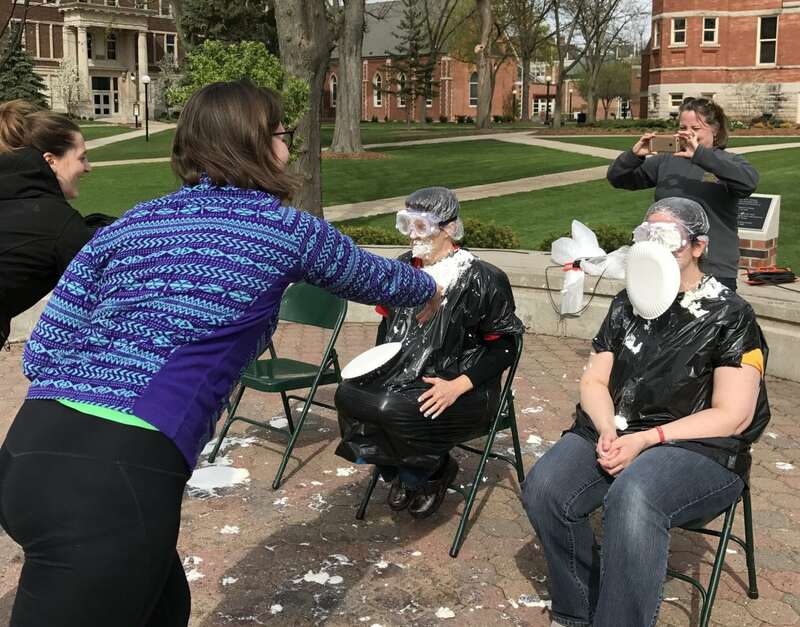 St. Norbert College’s Pie A Professor event. BuckeyeThon at The Ohio State University hosted their CarnOval event during the spring 2017 semester to help kick off the start of our BuckeyeThon 2018 year and gave a huge thanks to their campus as the academic year came to a close. 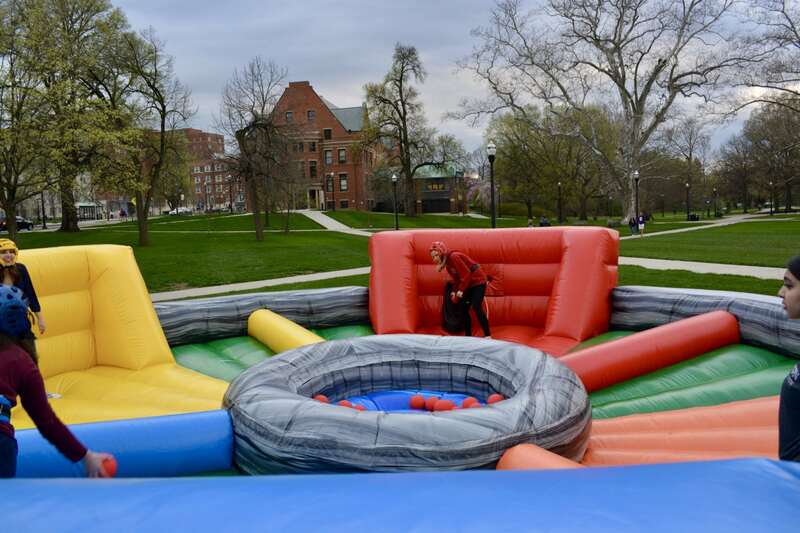 They brought 5 large-scale inflatables, 8 carnival-themed games, and food to one of their green spaces on campus, the South Oval. Hundreds of students, staff, faculty, and BuckeyeThon family members came out to celebrate the end of an unforgettable year. Attendees were welcomed by our mascot, Brutus, to climb the rock wall, race in the obstacle course, score a strike in grass bowling, or receive a henna tattoo—all while earning tickets! These tickets were then traded in for amazing prizes like fanny packs, tee-shirts, and water bottles. Those that registered for BuckeyeThon 2018 at the event also got to spin a huge prize wheel on the DJ stage. 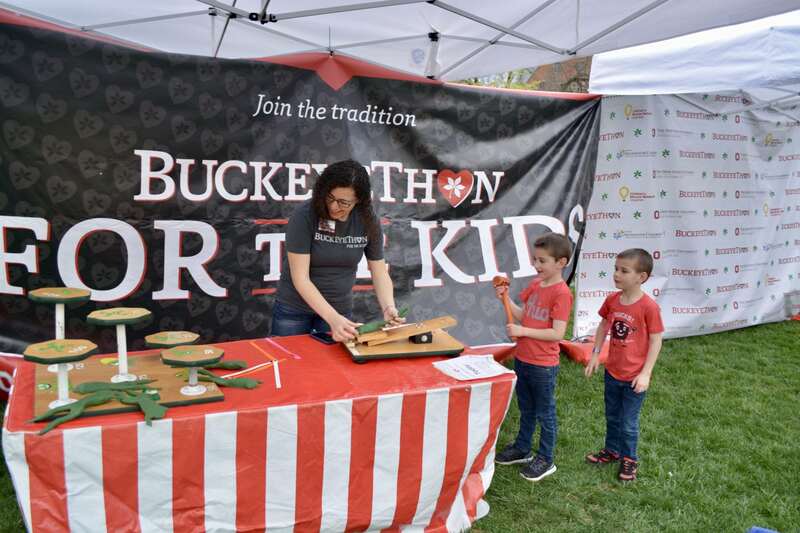 This was a high-energy and fun event that gave the Ohio State and Columbus communities an easy way to interact with and learn more about BuckeyeThon and its cause. This event proved to be far reaching with the variety of people who attended the event and with the number of people who had never been to a BuckeyeThon event before CarnOval. Using a streamlined check-in process, they counted over 650 people at CarnOval–more than they have had at any event other than the Dance Marathon. After the event, a survey was sent out to all attendees in order to gather data that allowed BuckeyThon to better understand their audience. For 36% of CarnOval attendees, this was their first BuckeyeThon event and, on a scale of 1-10, 74% ranked from 7-10 as having a greater cause connection after the event. Colorful Takeover: Dancers dress up in different colors each day and BYOB (Bring Your Own Bucket) to collect donations around campus in efforts to raise funds and spread awareness about Children’s Miracle Network Hospitals. Creative Competition: Dancers create a fun video, a painting, a picture, or any other creative content that Knight-Thon can share from their social media. The winner wins $500 in their team’s general donor drive. War at Lake Claire: Teams pay a suggested $50 fee to participate in our Dancer War that includes intense Minute to Win it games, inflatable competitions and a sand volleyball tournament. Teams receive points when they place in a game, as an incentive to win them. This was also an opportunity for the teams to spend one-on-one time with our Miracle Children and their families, whether that was eating a slice of pizza or playing in a Minute to Win it match. Our 2017 #ColorWars is underway! Check out our Snap story (Knight-Thon) for more videos of the action! Dance Marathon at the University of Florida‘s Transform Today has started a movement on the UF Campus. The entire UF campus comes together on Transform Today to spread awareness and raise funds for UF Health Shands Children’s Hospital, but differently than we do every other day. 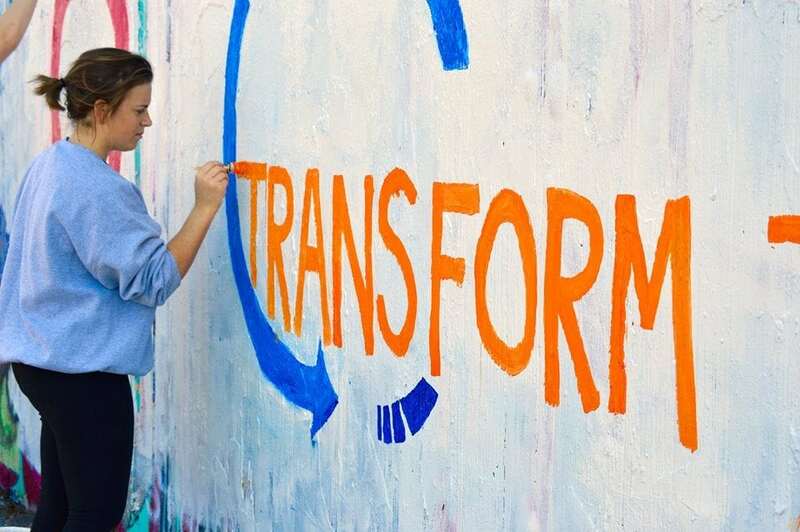 On Transform Today, the goals are both monetary and impact-based. DM at UF sets a public fundraising goal for the day and strives to widen their reach across the local community as much as possible. As they entered their third Transform Today, DM at UF knew that they wanted to completely revolutionize this fundraising push day by channeling their entire effort around the Miracle Families and their campaign for the year: Together We Can. They set an incredibly lofty goal of $262,000 on November 15th and mobilized their volunteers to make it happen. They had Captains passing out flyers and canning at 18 different locations in town; held Spirit Point check-ins in two locations on campus where Miracle Families were present and giving hospital bands to fundraisers; painted murals in two locations in Gainesville; and ran a Phone-A-Thon. They simultaneously had a running fundraising giveaway for sponsored merchandise and two hospitality nights at local restaurants. While all of this was happening, they had an incentive for all of our on-campus organizations to earn bonus Dancer Spots for their fundraising efforts. The next morning, after the 26.2 hours, they held a total reveal in the center of campus for students walking by, participants, Miracle Families, and faculty. DM at UF raised $422,557.77 in 26.2 hours on Transform Today through empowering their members to spread our mission to every member of the Gator Nation and beyond. #TransformToday was a monumental success! We blew our goal of $262,000 OUT OF THE WATER and raised $422,577 all FOR THE KIDS. Thank you to everyone who participated and donated. We could not have done it without you. #TogetherWeCan make miracles happen! Throughout the year, Terp Thon pledged to be bigger, bolder, one million stronger. In order to achieve this, they had to make innovative changes and additions to our yearlong efforts. With this mindset, they executed Rush To Raise, their first-ever special event specifically targeting Greek organizations at the University of Maryland. 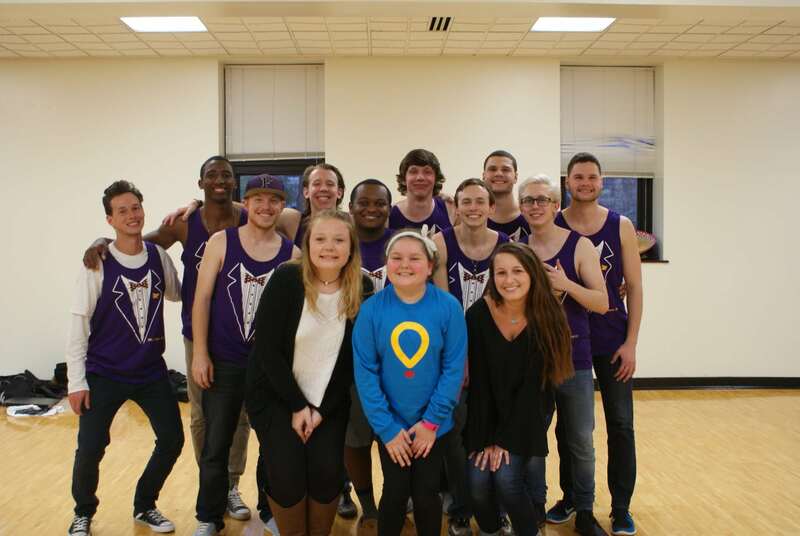 During Rush To Raise, they engaged their community of 1,000+ Greek dancers to unite and collectively fundraise $80,000 in just twenty-four hours. This fundraising event challenged dancers to be part of both their chapter-wide goal as well as a community-wide goal. During the planning stage of Rush To Raise, Greek Relations Committee members presented to Greek chapters on their fundraising in relation to the previous year. Statistics such as total fundraised and the total number of registered dancers in the chapter were shared. Greek Relations committee members met individually with chapter ambassadors to set targeted goals for Rush To Raise. Each chapter was encouraged to base their goal on a 38% increase from the previous year’s fundraising, since Terp Thon was striving for a 38% increase in our yearlong efforts. One-pagers were shared with each chapter giving tips on fundraising. Additionally, each returning Greek dancer received a Donor Card, which consisted of their donors from the previous year who have yet to donate to them this year. One week before Rush To Raise, Terp Thon had their first ever Recruitment Day of Miracles, where they registered over 800 dancers in one day and used this event to maximize the number of registered Greek dancers that we could engage on Rush To Raise. They offered the chapter that recruited the most dancers a matching fund for Rush To Raise. With less than two months until our eighth annual Dance Marathon, register for Terp Thon 2017 today! Regardless of what Greek letters you wear, stand FTK with Terp Thon on March 4th. During Rush To Raise, they had different campaigns presented to each chapter focusing on most donations received as a chapter, chapter with the least number of zero dollar dancers and top individual fundraiser. 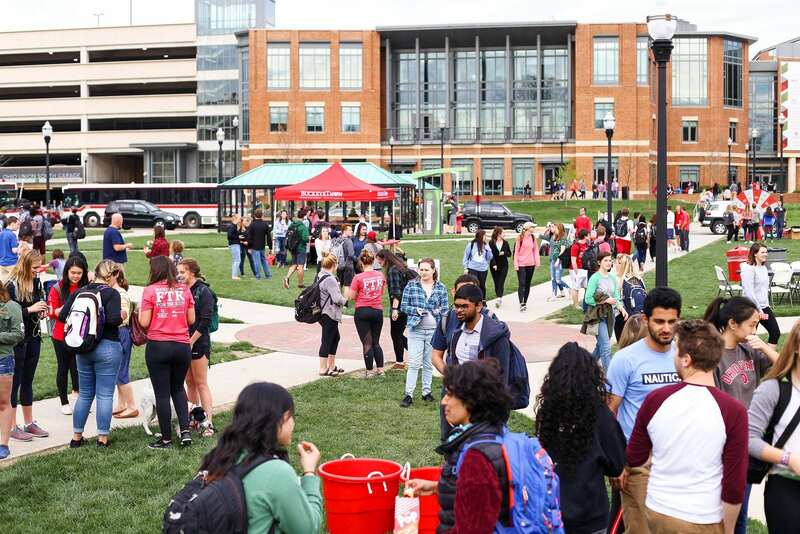 Incentives included a Jimmy John’s lunch, Insomnia cookies, Terp Thon vintage shirts, a $1,000 donation used for matching, and a raffle for a Patagonia backpack. During the twenty-four hour period, the Greek community came together to raise $60,603.41. Success was measured in more than just fundraising. In twenty-four hours, they were able to engage 45 chapters who had set chapter goals and fundraised with a total 519 Greek dancers who received one or more donations throughout the day. Of those 519 Greek dancers, 210 were previously zero dollar dancers who each received a donation on Rush To Raise collectively contributing to over $19,000 of the day’s total. Soonerthon started their year off with a new event that they called the “Block Party.” The idea behind this event stemmed from their desire to engage the city of Norman and its surrounding areas along with our college campus earlier in the year. 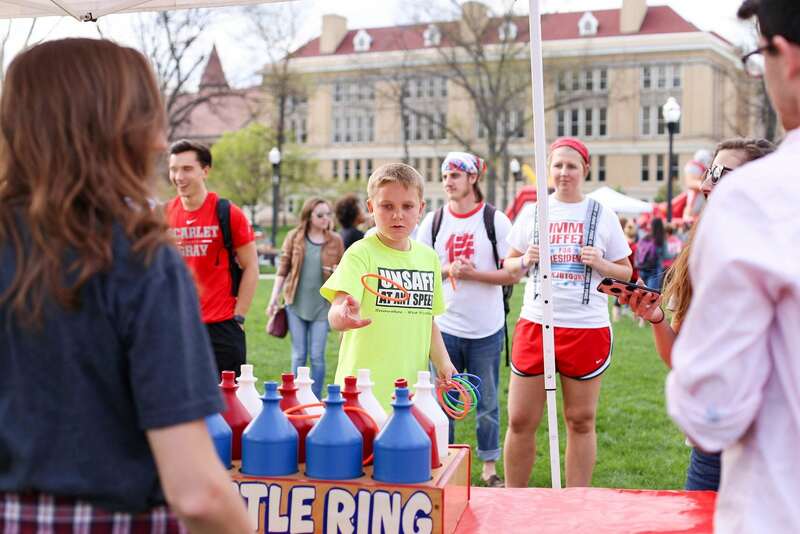 This event was centered around bringing the community together to enjoy live music, food trucks, and learn about the awesome cause that is Soonerthon. They held the event on a Friday afternoon in a public park only a few miles from campus. We had local artists, mainly college students, perform throughout the evening and brought in four food trucks that allowed a percentage of their revenue to be donated back to Soonerthon. Student organizations set up booths to face paint and play games with miracle families, and the ROTC brought inflatables to the event. Soonerthon made sure to have as many miracle families as possible at the event to incorporate opportunities for everyone to find their “whys” and love for the cause. The Block Party allowed for true cause connection because it placed these families and kids in direct connect with college students and other members of the community. Vanderbilt University Dance Marathon‘s E(DM) event is a DJ competition that is hosted in collaboration with one of Vanderbilt’s most prominent student organizations, Vanderbilt Programming Board (VPB). VUDM identified the campus’s Rites of Spring (the springtime music festival that takes place each April) as one of the most prominent events on campus that draws a large group of students and came up with a way for them to insert themselves into the excitement around the event.VUDM came up with the idea for a DJ competition, which they called E(DM). After advertising the event and accepting applications from student DJs, the president and vice presidents would choose four DJs to compete. The time slot they would perform in was determined by how much they fundraised during the week before E(DM). At the event, every member of the crowd got to vote for one contestant, and the contestant with the most votes won the coveted opening act spot at Rites of Spring. Tickets were sold beforehand and at the door, with 100% of the sales going toward VUDM’s fundraising goal. The goal of this event was to draw in a new crowd to VUDM, with DJs being selected based on talent from diverse backgrounds. Additionally, they hoped the event, which took place the month before their Dance Marathon event, would increase awareness and anticipation for the DM after a long winter break. They also felt that partnering with VPB would help to increase their exposure on campus. These specific objectives connected to our overall goals of expanding and diversifying the organization. Vanderbilt University Dance Marathon’s E(DM) DJ Competition.